Good afternoon Lions and Lionesses, Knights of the Blind, ladies and gentlemen. Thank you for inviting me to be here. 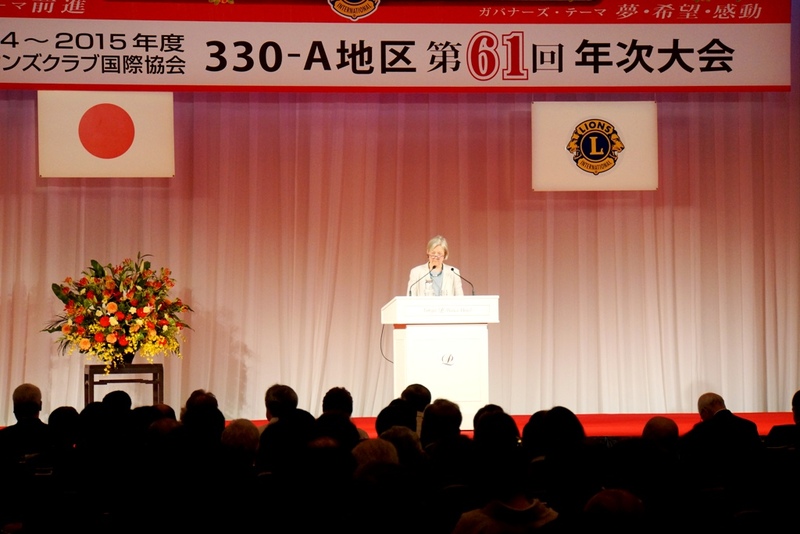 I would like to extend special appreciation to 330-A District Governor Shiotsuki for his inspiring leadership to increase women’s membership in the Lions Clubs International, Japan. I also want to thank Mr. Akira Amari, Minister in charge of Economic Revitalization and Minister of State for Economic and Fiscal Policy. Your role in promoting the Abe Administration’s growth strategy, including women’s advancement and policies to raise the participation of women in government and company leadership, is making a difference in the lives of women in Japan. The Lions Club is one of the biggest social service groups in the world. The purpose of the Lions Club, “to create and foster a spirit of understanding among the peoples of the world,” is especially close to my heart. This is one of my own personal goals as a diplomat representing the United States of America. Also, I read with great interest the Lions Club “Project Refresh” released in January 2015. This report was a statistical analysis of growth patterns of club and membership (11 years of data). It showed that women members are growing in Lions Clubs: Worldwide, 75% of Lions clubs have women members and 43% in North America have more than 30% women members (37% of clubs worldwide have more than 30% women members). Ambassador Kennedy has made women’s empowerment one of the mission priorities for our Embassy in 2015. She recognizes that “when women succeed, we all succeed.” President Obama and Prime Minister Abe have both recognized that a modern economy requires full participation of women and men in the workplace. Over the past year, Ambassador Kennedy and diplomats like me have spoken to countless women and men in various industries about the American experience and what we can share about our experience in advancing social change and diversity, including leadership training, mentoring, childcare, and entrepreneurship. Our goal for the coming year is to continue “telling the story” of the American experience. We want to reach professional women, but also men in positions of power, young people, and families. 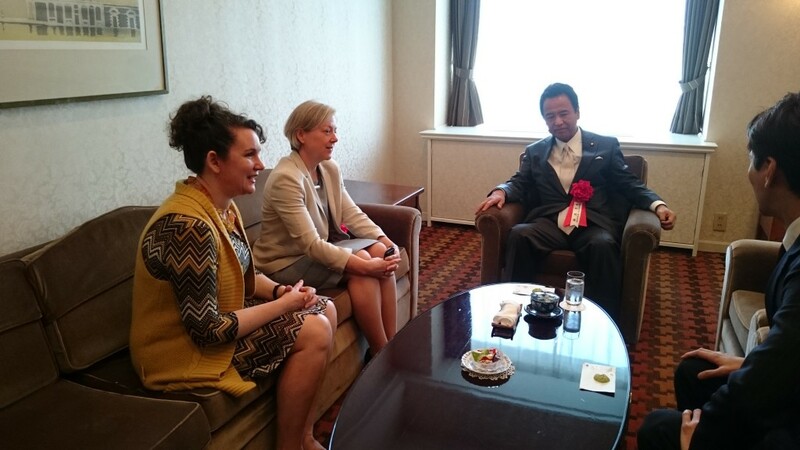 In addition, we continue to look for leaders in women’s empowerment here in Japan to lend them our support and encouragement. Groups like the Lions Club are so important for women’s empowerment. Your club is a place where women can find a mentor or talk about a challenge at work. As you work side by side on your volunteer projects, you are building relationships and developing potential—lessons that will transfer to the work environment. As you encourage women to take leadership roles in your club, they will gain leadership skills and confidence. Mrs. Michelle Obama just made her first trip to Japan in March. She and Japan’s first lady Akie Abe launched an initiative to promote girls’ education in developing countries, “Let Girls Learn. This is one of the many partnerships between the United States and Japan. She said in her speech: . . .Although we have made tremendous strides in girls’ education in the United States and Japan, women in both our countries still struggle to balance the needs of their families with the demands of their careers.